Back in gear for S32! You picked a good day to read a recap, because tonight I am unveiling something very amazing for classic game show fans, if you want to know what it is, then all you need to do is scroll to the bottom of this recap, and you'll find out exactly what it is. Susan Morsoff – A homemaker, a mother of one daughter with an interest in photography. Lee Taylor – A bus driver in Los Angeles, California. A former parachutist. Ginger Rydell – One-Day champ with a total of $3,000 in prizes. Chuck spins the Wheel, tells us the top dollar value is $750, but to watch out for that black space Bankrupt, because if you hit it, you lose your cash, but not your merchandise, because once you buy a prize, it's yours to keep. Susan won the draw backstage, and she gets to spin first today. SPIN 4- Ginger | Value: BANKRUPT! SPIN 9- Susan | Value: FREE SPIN! | $200 | Notes: Holding FREE SPIN. SPIN 10- Susan | Value: $100 | Call: D | Amt: 1 | $300 | Notes: Holding FREE SPIN. SPIN 11- Susan | Value: $250 | Call: H | Amt: 2 | $800 | Notes: Holding FREE SPIN. Susan solves HERO SANDWICH for $1300! Lee is in the second position, which means he will start the second round. SPIN 2- Lee | Value: LOSE A TURN! Chuck asks contestants to turn their backs, it's time for a commercial. We're back. Ginger called a wrong letter before the commercial, so Susan will spin now. Susan can't stand it any longer! Susan solves AS PLAIN AS THE NOSE ON YOUR FACE for $4600! Our returning champ Ginger will start the third round. A moderate $500 a piece. Susan got the last letter wrong, so we're over to Lee. Lee | Call: P | Miscall | $1000 | Notes: Not acknowledged by Chuck as already being called. No bonus round in the Woolery version, so Susan will return tomorrow for more on Wheel of Fortune! Sale of the Century Video Archive, hope you enjoy it! 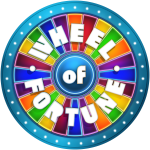 From BAV Studios, it's UltimaGanon's Wheel of Fortune recaps! Wasn't LANDMARK a category at this point? Shouldn't RADIO CITY.... have been under LANDMARK?